More than a year after Mexican journalist and writer Javier Valdez was murdered, the details of his case are finally coming to light. Towards the end of 2019, a new wrinkle emerged: Just one day after Valdez's death, two of his colleagues received mobile phone messages infected with the surveillance software Pegasus. Javier Valdez was a dedicated journalist who, among other things, covered stories about corruption, impunity and organized crime for the independent media outlet Ríodoce, which he co-founded in Culiacán, Sinaloa (a disputed territory that both the Jalisco Cartel and the Sinaloa Cartel claim). On May 17, 2017 Valdez was shot 12 times in broad daylight, just outside Ríodoce's offices. 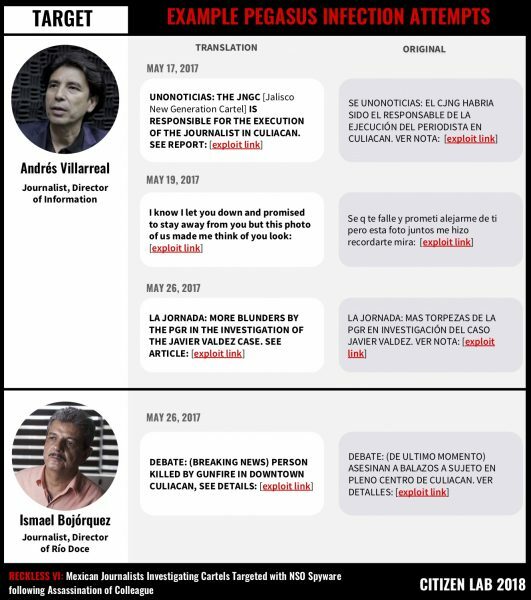 According to a research report by the Digital Rights Defense Network (R3D) and a partnership of international NGOs, both Ismael Bojórquez (director of Ríodoce) and its director of information, Andrés Villarreal, suffered hacking attempts on their cell phones via text message. Combined with other cases that we have reported previously, this amounts to a total of 28 cases of attempted infection with Pegasus, against various journalists, activists, and human rights defenders in the country. Attempts to infect Valdez's colleagues followed a similar procedure to other attacks with Pegasus. The messages were received via SMS, and were allegedly sent by a popular news service called “UnoTV”. The content was difficult to ignore — particularly since the messages referencing the then-recent murder of Valdez and significant related events. At the end of each message there was a suspicious link that, when clicked, would immediately install the surveillance software or spyware. This allowed the spyware to monitor any information hosted on the device and even take control of the microphone and camera. Image taken from the report “Reckless VI. Mexican Journalists Investigating Cartels Targeted with NSO Spyware Following Assassination of Colleague”. Citizen Lab 2018. One of the most noteworthy conclusions of the report was that there seemed to be a common attacker in all cases, given the methods of infection and the use of the same infrastructure. Moreover, it was noted that the software was used in situations affecting Peña Nieto's outgoing administration. Pegasus is a sophisticated tool sold exclusively to government agencies. The technology was acquired by the Mexican government in 2014 and 2015 for the alleged purpose of fighting organized crime. As such, this series of revelations is now colloquially referred to online under the label #GobiernoEspía (#SpyGovernment in English). With this seventh publication on abuses of NSO Group spyware in Mexico, Citizen Lab and our partners R3D, SocialTic, and Article 19 have identified a total of 24 cases of abusive targeting by Mexico-linked NSO Group customers. Our previous investigations identified infection attempts against multiple journalists, lawyers, international investigators, public health practitioners, senior politicians, and anti-corruption activists. After more than two decades of pursuing critical journalism, Javier Valdez became an exemplar, on a national and international level, on issues related to the violence that is devastating the northern part of the country. Many thought that this would protect him, but it did not. The journalists’ guild showed profound indignation in response to Valdez's death, through protests, acts of denunciation, and labor strikes throughout the country. Si matan a Javier Valdez, nuestro querido Javier, el más conocido, el más premiado, el más divertido, el más protegido del gremio: ¿qué puede esperar el resto? Es como si a todos nos hubieran puesto un blanco en el pecho. If they killed Javier Valdez, our beloved Javier, the most well-known, most acclaimed, most fun and most protected member in the field, what can the rest of us expect? It is as if we all have a target on our backs. 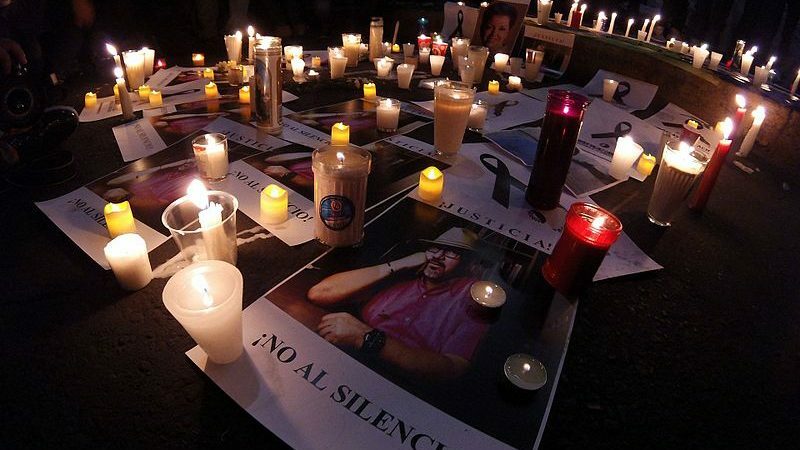 The Mexican government has a terrible record when it comes to human rights and the circumstances facing journalism in the country are especially grave. On this note, the organizations that are reporting on #SpyGovernment cases see it as a positive sign that current president Andrés Manuel López Obrador recently stated at a press conference that his government will not engage in such practices. However, those declarations will not be much of a guarantee if crimes against journalists remain unpunished.